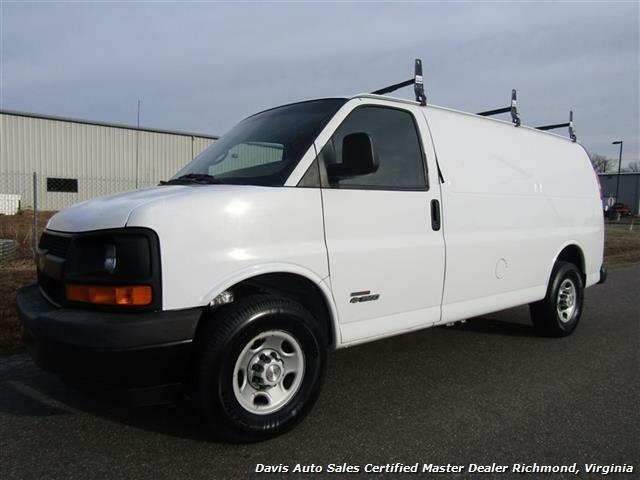 Chevrolet Express 3500 6.6 Duramax Turbo Diesel 1 Ton Cargo Work, 2006 Chevrolet express 3500 1 Ton cargo commercial work van 6.6 Duramax turbo diesel. Yes that's right, oddly enough this is a Duramax diesel equipped van, first one we have ever had our hands on. 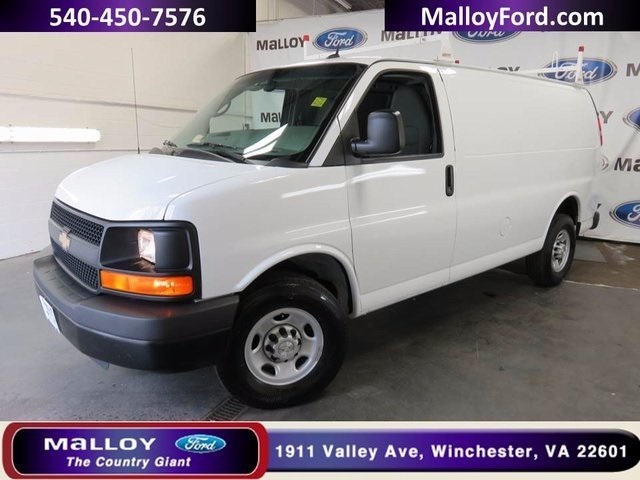 Equipped with left and right side shelving and safety security divider, no windows in the rear cargo area at all, heaviest duty van Chevrolet makes, and does have trailer tow mode, triple Ladder racks, and heavy duty padlock door locks. Extra keys. 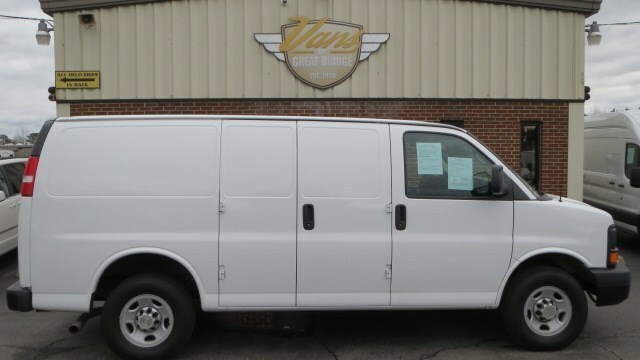 Processing for service and inspection at this time this van will be ready to go and able to load your tools and put to work immediately!! Finance assistance available and apply online at as well as cash deals welcomed. 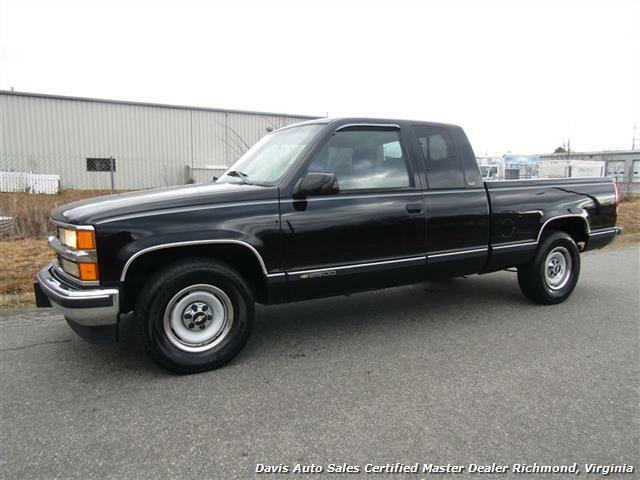 Chevrolet C/K Pickup 2500 Silverado Extended Cab Short Bed Vortec 350, 1997 Chevrolet Silverado C/K 2500 Extended Cab Short Bed Vortec V8 and 5.7 L 350 Engine. If your grandpa owned a truck this may actually be it, only 64,000 original miles, interior looks like it's a quilt over the seats and in the floor it's whole life, straight clean rust free body, untouched and unmodified in anyway. 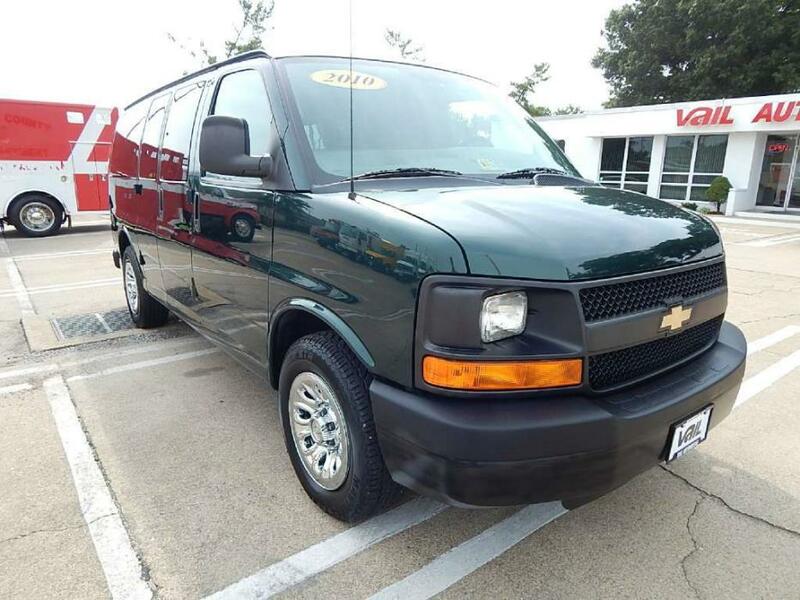 Heavy duty suspension, six passenger seating, bedliner, power windows, power door locks, tilt and cruise, AM/FM stereo, tow package, etc, you name it. This truck is as original as it gets and solid in every way. Great driving this vehicle, you think you're in a 2015 model, operates perfectly. While fully servicing and inspecting it we replaced all tire rods, alarm, Pitman arm, brakes, rotors, just to assure it was perfect, these items were not needed due to the mileage, but they just had slight play, sparing no expense to replace them. Limited finance options are available, even some in-house finance options for this particular vehicle, apply at , Navy Federal checks USAA checks accepted as well, and cash deals welcomed. Chevrolet Silverado 2500 HD LT 4X4 Z71 Off Road Crew Cab Short Bed, 2013 Chevrolet Silverado 2500 HD Crew Cab Short Bed 4X4 Z71 Off-Road Package LT Edition. 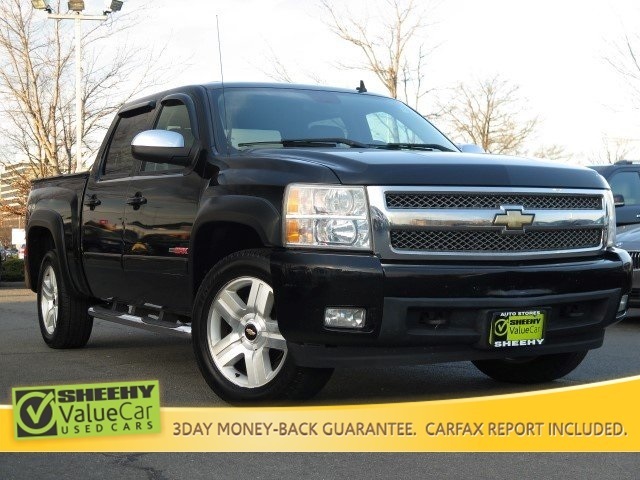 Options include: six passenger seating, fold up Console, dual digital climate control, traction control, cd player, power seat, side step, running boards, spray in bedliner, 18 inch alloy wheels, tow package, trailer brake control, on star, vent visors, Remote start keyless entry, both keys and remotes, and much more. Freshly detailed and undercarriage sprayed for protection. Just serviced at the GM dealer and properly inspected. Aside from a little bit of corrosion on the wheels and a scratch on the tailgate that has been touched up, this truck is extremely clean and well-kept. 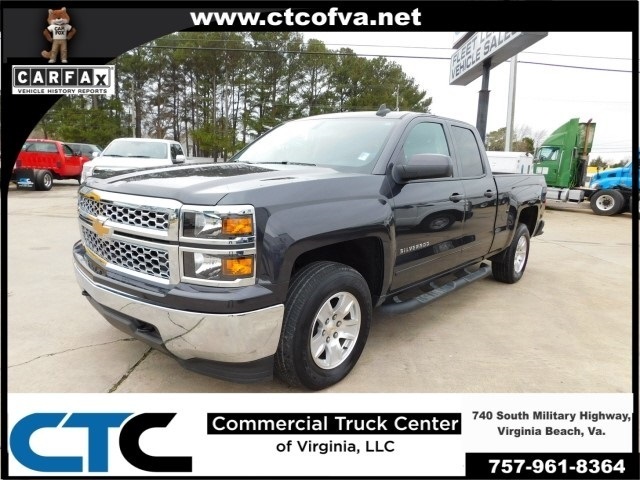 Finance options are available, this truck is priced extremely well compared to NADA value, apply at , we also accept Navy Federal and USAA checks or will be happy to work with your bank or credit union. 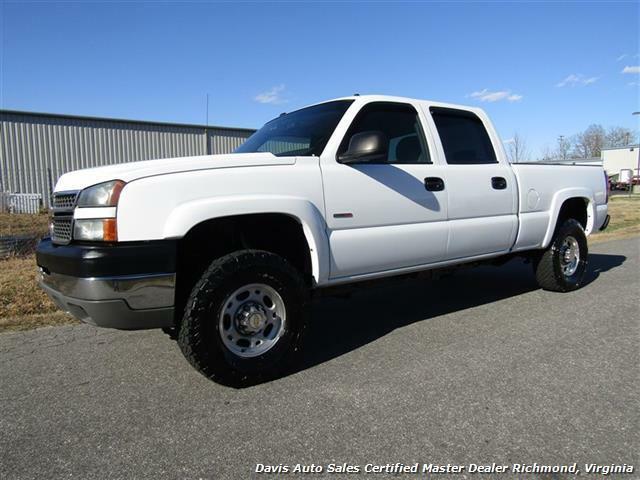 Chevrolet Silverado 2500 HD LT 6.6 Duramax Diesel 4X4 Crew Cab Short Bed, 2005 Chevrolet 2500 HD Silverado LT crew cab short bed 4x4 6.6 Duramax turbo diesel. You may think you are looking at photos for a $40,000 truck as perfect as this truck is, but these photos are right. 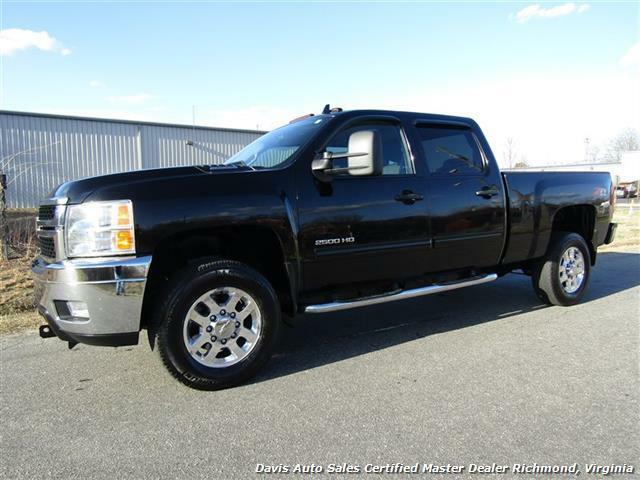 This Duramax with Allison trans crew cab HD needs nothing but a happy new owner, previously locally owned by a traveling sales rep hence the high mileage. We just fully serviced and inspected this truck, new brakes and rotors installed, both belts, even replace the dash cluster one of GM's pesky problems. This truck is just getting started in its life. 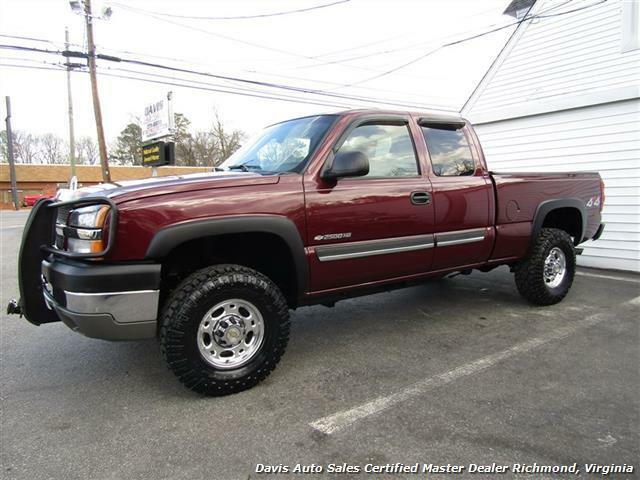 Options include: touchscreen JVC cd player, Bose stereo, husky floor mats, spray in bedliner, Color match factory fender flares, basically new BF goodrich one size over stock tires, completely rust free undercarriage, tow package, vent visors, power seat not the first rip or tear on this truck anywhere and zero rust not your typical Chevrolet at all. This truck is shockingly nice and FAR above average. Finance options are available, apply at , we also accept Navy Federal and USAA checks , we will also assist with your bank or credit union for financing. 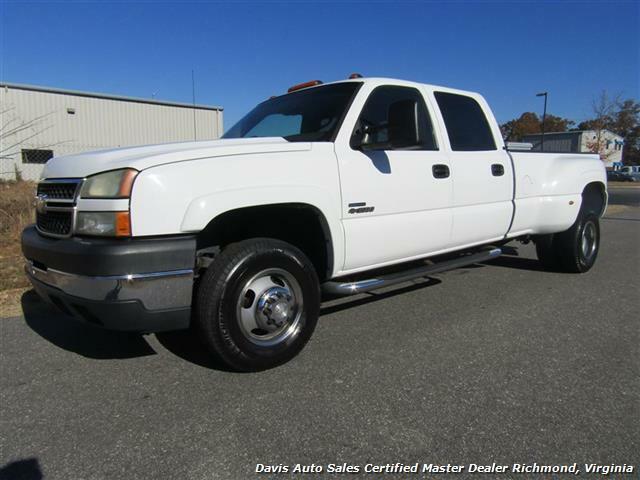 Chevrolet Silverado 2500 HD LS Lifted 4X4 Extended Cab Short Bed, 2003 Chevrolet Silverado 2500 HD LS extended cab short bed 4x4 pick up. This truck is leveled out riding on brand new Goodyear Wrangler Duratrac tires leveling kit and a brand-new transmission and transfer case. 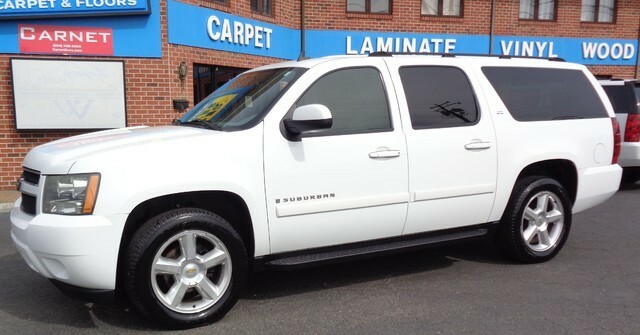 Other features include: bedliner, alloy wheels, fender flares, tow package, power seat, vent visors, CD player with Bose premium stereo, dual climate control, pushbutton 4x4, rear window defroster, freshly serviced and inspected, detailed, undercarriage sprayed for protection ready to go. We traded the truck in on the classic Silverado, have been over it from head to toe checks out very well one door nice truck more photos to come first of the week. 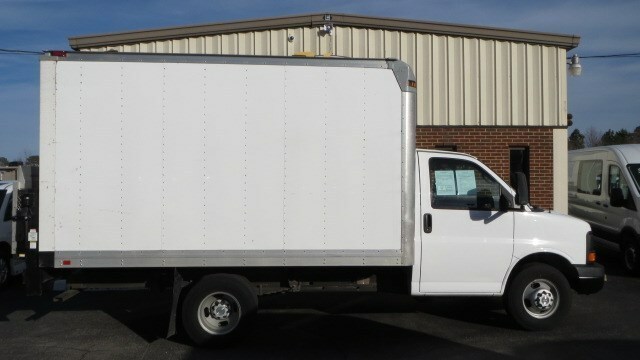 Call for details or questions and finance options are available www.aboveaveragetrucks.com, we also accept USAA and Navy Federal checks, and cash deals are welcomed. 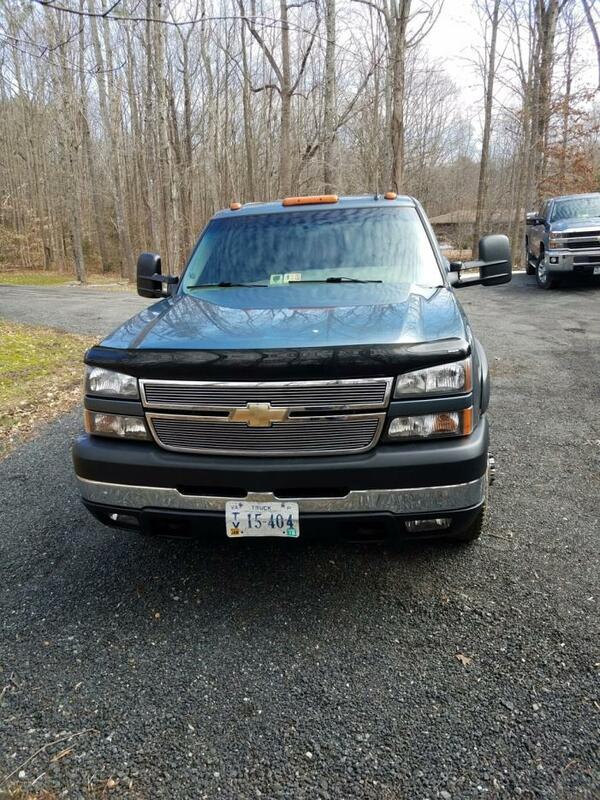 Chevrolet Silverado 3500 Classic LS 6.6 Duramax Diesel Dually 4X4 Crew Cab Long Bed, 2007 Classic Chevrolet 3500 HD Crew Cab Silverado LS Long Bed Dually 4X4 6.6 Duramax Turbo Diesel with Allison Transmission. 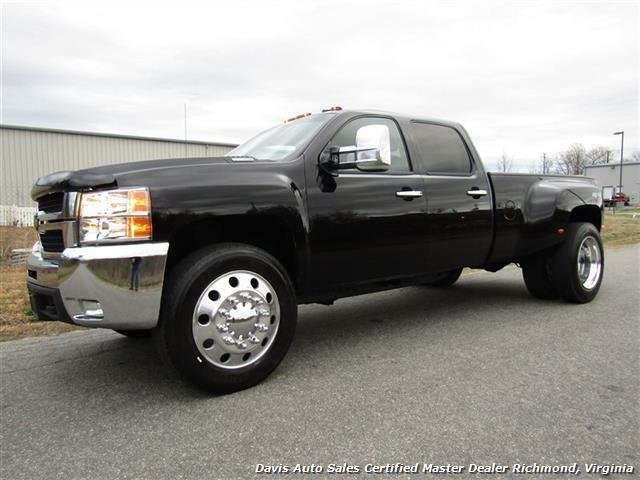 We have been driving this dually quite a bit, mileage is extremmely high, but we are very confident in its abilities and it checks out very well. Still includes our standard warranty at no additional charge. Everything works and functions as it should. Fifth wheel hitch included has rails for gooseneck also, tag along hitch, tow mirrors, Michelin Tires, 6 passenger seating, tool box, very well equipped and loaded. Call for appointment to view and for further details. Cash deals welcomed, Navy Federal and USAA checks accepted, finance options available apply online at .